In a sauce pan, cook the ground meat and onion on medium until the meat is browned. Drain/strain the excess liquid. Add the zucchini, whole grain, corn, beans, taco seasonings, and water to the pan. Cook on medium and stir for 5 minutes. Stuff the bell peppers and put them in the crockpot. If you have extra stuffing mixture, keep it to add to the tomato sauce. Add and mix the tomato sauce and diced tomatoes in the saucepan with the extra stuffing mixture. Pour the tomato mixture over the stuffed peppers. Cook the stuffed peppers on HIGH for 2-3 hours (LOW for 4-6 hours) or until the peppers are soft to your liking. Optional Toppings: homemade guacamole and non-fat greek yogurt. 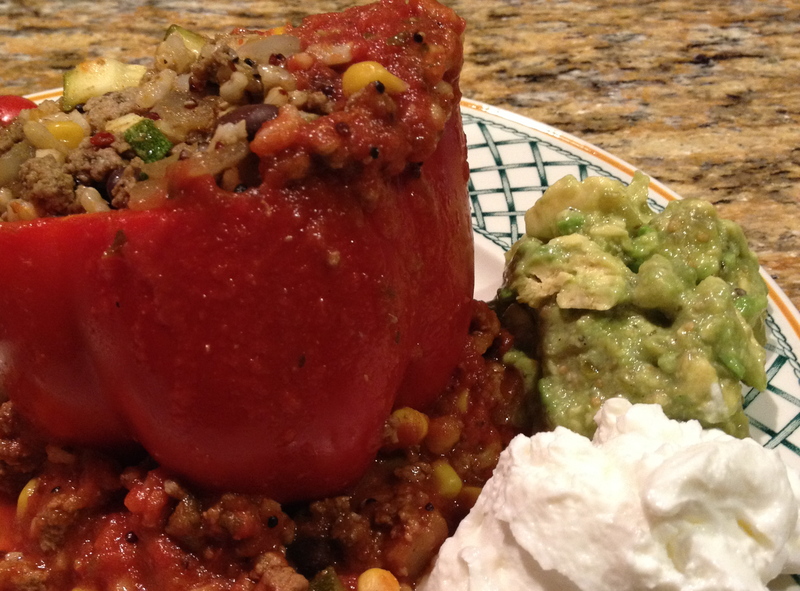 Find this recipe featured in my post, Week 7 Crockpot Meals: Mexican Stuffed Peppers!